only 14.5 pounds and measures 71.5” x 16” x 1.75”, occupying minimal storage space. The oversized hand holds on the Morrison Select Spineboard easily accommodate gloved hands and allow for both Loop-Lok and speed clip spineboard straps to be attached easily in pinned slots. Pins are molded into the spineboard, increasing their durability. Hand holds are raised for easy lifting and preventing scraped knuckles and straps. Recessed edge contours provide extra stabilization of standard head immobilizers. 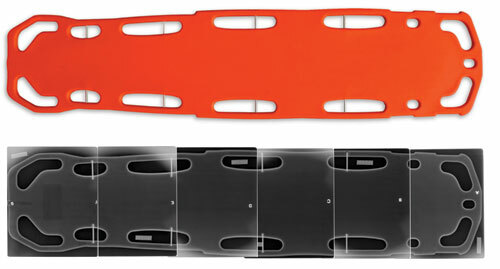 The Morrison Medical Backboard tapers toward the foot end for easy extrication in confined areas. This also provides a more narrow area ideal for pediatric use. High degree of x-ray translucency. The Morrison Select Spineboard is great for patient transport. Proudly made in the USA! Morrison Select Spineboard : Dimensions: 71.5" x 16" x 1.75"
Morrison Select Backboard : Made in the USA! optional pins (see below). The pins do not interfere with the vital imaging areas.